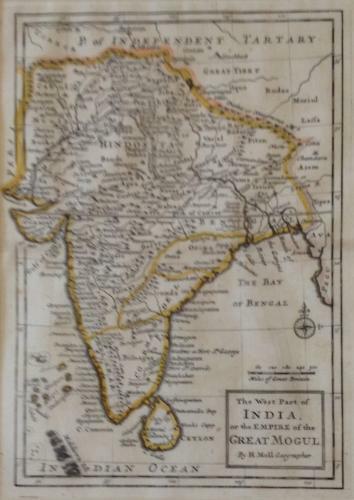 Title: 'The West Part Of India or the Empire of the Great Mogul'. This beautiful original antique map is by Herman Moll, one of the most well regarded mapmakers in England during the early 1700’s. It is from Atlas Geographus: Or, a Complete System of Geography, Ancient and Modern. Containing what is of most use in Bleau, Varenius, Cellarius, Cluverius, Baudrand, Brietius, Sanson&c. With the Discoveries and Improvements of the best Modern Authors to this Time......, done from the Latest Observations by Herman Moll, Geographer; and many other Cuts by the best Artists, 5 vols. Published in London by John Nott, 1711. In excellent condition. It is printed on one side only and is perfect for framing. The hand colouring all original.